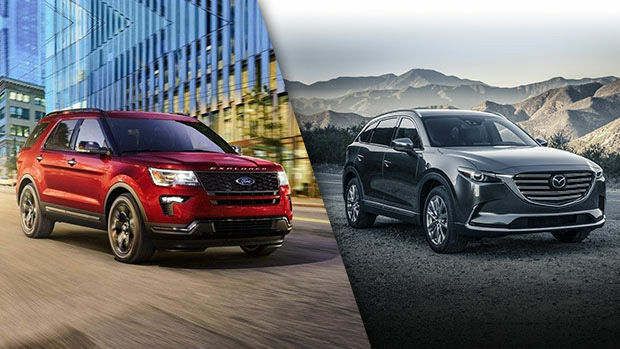 Compare the 2019 Ford Explorer to the 2019 Mazda CX-9. Find out about Mazda SUVs and SKYACTIV-G technology at your Spinelli Mazda dealership. Discover the SKYACTIV-G technology and Mazda SUVs at your Spinelli Mazda dealership, in the West Island near Ville Saint-Laurent. You will realize substantial savings on the leasing or purchase of your new 2019 Mazda CX-9 by taking advantage of our exciting Mazda promotions and the benefits of our financing programmes. The innovative technological devices on the 2019 CX-9, offered by your Mazda dealership near Montreal, clearly distinguish it from the 2019 Ford Explorer. With its SKYACTIV-G 2.5-litre, 4-cylinder turbocharged engine with dynamic pressure, the Mazda 2019 CX-9, near Laval, consumes only 10.6 L/100 km in the city and 8.4 L/100 km on the highway. In comparison, the 2019 Ford Explorer with its 2.3-litre EcoBoost engine guzzles 13.1 L/100 km in the city and 9.2 L/100 km on the highway. Despite its higher fuel consumption than the 2019 CX-9, the 2019 Explorer develops the same engine torque (310 lb-ft). It tows only 1,361 kg (3,000 lbs) while the 2019 Mazda CX-9 can pull a 1,588 kg (3,500 lbs) load. The 2019 CX-9, near the West Island, is equipped with SKYACTIV Dynamic Vehicle Control with G-Force Vector Control (GVC). This unique Mazda technology was awarded the 2017 Best New Technology Innovation Award by the Automotive Journalists Association of Canada (AJAC). With the GVC, the CX-9, near Laval, requires less steering adjustments on the part of the driver and eliminates the sway of the head and body of its occupants to provide them with better comfort. Indulge yourself and try a Mazda CX-9! Book your test drive with a Spinelli Mazda advisor.